Towards the beginning of the 20th century, Edward Said expected that ‘Displacement is becoming the norm’ (quoted in Malkki 1992). Today, the UN Higher Commissioner for Refugees claims that ‘around the world, a person is being displaced every three seconds, forced from their homes by violence, war and persecution’ (World Economic Forum 2017). 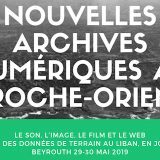 Crossing the borders and trying to adapt to new environments, refugees and migrants do not only carry their important documents and belongings with them; but also their memories and urban experiences of the places where they used to live. This trans-nationalization of memories and urban experiences are not only affecting how people perceive their ‘arrival cities’ but also how they co-produce space and thus, contribute to the ever-changing urban realities we live in. Under these conditions, concepts like heritage, memory, displacement and the city open a new field for exploring what Lefebvre calls “la problématique urbaine”. 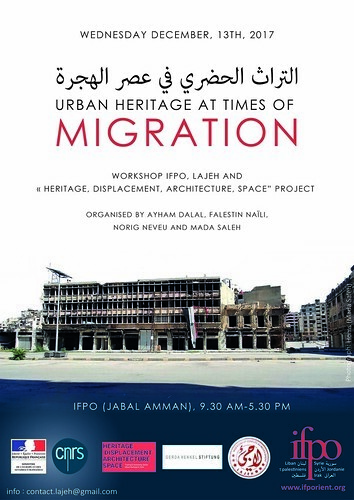 This workshop entitled The Urban Heritage of the Contemporary is organized as part on the ongoing research-art project ‘Tracing and Assessing Syrian Urban Heritage in Exile ‘funded by the Gerda Henkel Foundation, which aims to explore how refugees remember and relate to their ‘home’ cities during exile and in coordination with the Lajeh programme. 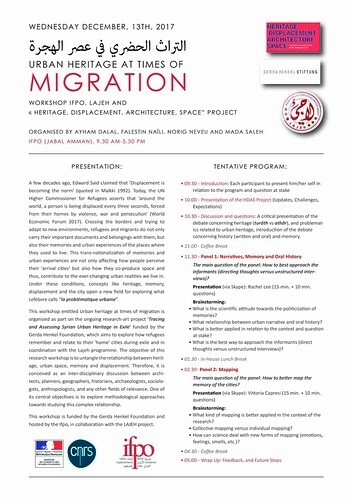 The objective of this research workshop is to unfold the relationship between heritage, urban space, memory and displacement. 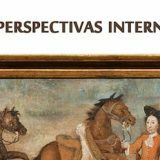 Therefore, it is conceived as an inter-disciplinary discussion between architects, planners, geographers, historians, archaeologists, sociologists, anthropologists, and any other fields of relevance. One of its central objectives is to explore methodological approaches towards studying this complex relationship. Each participant to present him/her self in relation to the program and question at stake. 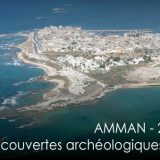 10.30 – 11.00: Discussion and questions: A critical presentation of the debate concerning heritage (turath vs athar), and problematics related to urban heritage + introduction of the debate concerning history (written and oral) and memory. The main question of the panel: How to best approach the informants (directing thoughts versus unstructured interviews)? What is the scientific attitude towards the politicization of memories? 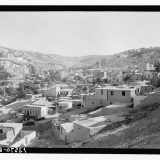 What relationship between urban narrative and oral history? What is better applied in relation to the context and question at stake? What is the best way to approach the informants (direct thoughts vis-a-vis unstructured interviews)? The main question of the panel: How to better map the memory of the cities? What kind of mapping is better applied in the context of the research? Collective mapping versus individual mapping? How can science deal with new forms of mapping (emotions, feelings, smells, odours…etc.)? 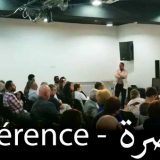 L’atelier d’écriture : un espace d’exploration de la langue ?